Can Mindfulness Curb Restaurant Overeating? MONDAY, January 9, 2012 (Health.com) — Supersized portions and high-calorie dishes in restaurants are often blamed for contributing to America's obesity epidemic, and for good reason. People tend to carry more body fat if they eat out frequently, and they tend to consume more calories and fat in restaurants than they do when eating at home, studies suggest. Eating 200 or 300 extra calories in a restaurant once or twice a week may not seem like a big deal, but those calories can add up. "The restaurant is a high-risk food environment," says Gayle Timmerman, PhD, a nursing professor at The University of Texas at Austin who studies eating patterns. 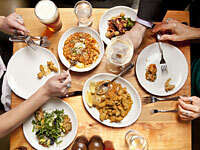 "There's a pretty good chance if you eat out frequently you're likely to gain weight over time." How can people fend off these extra calories? We can stay away from restaurants altogether, of course, but for most of us that's not a viable—or particularly appealing—option. A small new study, led by Timmerman and published this week in the Journal of Nutrition and Education Behavior, offers another potential strategy: mindful eating, a series of dining techniques that stress close attention to the enjoyment of eating and feelings of hunger and fullness. The study included 35 middle-aged women who ate out at least three times per week and ranged in body size from slim to morbidly obese. (Roughly 30% of the women were dieting when they enrolled in the study, and another 23% were actively trying to maintain their weight.) The researchers randomly selected about half of the women to serve as a control group, and assigned the other half to a six-week mindful eating program. The program consisted of weekly two-hour sessions in which an instructor taught the women how to limit overeating and make healthy food choices in different settings—choosing steamed rice instead of fried in Chinese restaurants, for example, or black beans instead of refried in Mexican restaurants. Then, at the end of each session, the women completed a mindful eating exercise, such as focusing on their feelings of hunger while eating cheese and crackers, or on their sensations of fullness while eating chocolate. At the end of the program, the women were eating in restaurants (or ordering takeout) just as often as they had before—nearly six times a week, on average. Yet they'd lost an average of 3.75 pounds and were eating about 300 fewer calories per day. (Weight and calorie intake didn't change in the control group.) What's more, restaurant meals accounted for just 124 of those daily calories, suggesting that the participants were eating less at home, too. Susan Albers, Psy.D., a psychologist at the Cleveland Clinic and the author of Eating Mindfully, isn't surprised that changes in eating behavior seemed to carry over from restaurants into the home, since she's seen a similar transformation after teaching her patients mindful eating techniques. "Once you've learned mindful eating skills, you tend to use them whether you are eating at your own kitchen table or at a five-star restaurant," she says. Mindful eating is an offshoot of "mindfulness," a meditative frame of mind that involves practicing a concentrated, nonjudgmental awareness of one's body and thoughts. Mindfulness belongs to the Buddhist tradition and has more recently been applied to Western psychology, stress and pain management, and the treatment of depression and anxiety. When applied to eating, mindfulness is intended to correct Americans' tendency to eat too fast, often while doing something else at the same time (such as watching TV). Not only do people tend to eat more when they're not paying attention, but some evidence suggests that we even digest food less effectively. "In general, we've lost the art of savoring food," says Albers, who did not participate in Timmerman's study. "We can eat an entire plate of food and not taste one bite. Mindful eating skills teach you how to eat less but enjoy it more." Although the rationale behind mindful eating makes intuitive sense, only a handful of small trials have tested whether the approach is effective for weight management. And Timmerman's study, despite the promising results, is itself merely a pilot study that will need to be expanded and strengthened to confirm the benefits of mindful eating in restaurants. A major shortcoming of the study is the fact that the women in the control group received no intervention at all and were simply put on a waiting list, says Barbara J. Rolls, PhD, a professor of nutritional sciences at Pennsylvania State University, in State College. "Previous research shows that simply spending time with the [instructor] can affect the outcome, so it is important to match 'face' time," Rolls says. A thorough test of Timmerman's six-week program would entail comparing the effectiveness of the mindful eating sessions with a similar number of general nutrition sessions, as well as observing "what the patients did in the restaurants," she says. Think twice before ordering. People can fall into a rut of eating the same dishes at the same restaurant, or they may say yes without thinking if a waitress suggests an appetizer, Albers says. Mindful eating involves "breaking those autopilot habits that we have around eating," she says. Make each calorie count. Think about what you really love to eat, and save your calorie budget to spend on those foods, Timmerman advises. "Does that cheese on the burger really make it for you? If not, that's about a hundred calories," she says. On the side, please. Gravy, salad dressing, butter—if you can ask for something on the side, do it. "Then you have control of how much…you really need or want on there," Timmerman says. Think before you eat. Before you dig in, take a moment to ask yourself how hungry you are on a scale of 1 to 10, and how that hunger matches up with what you've got in front of you. Remember, you don't have to clear your plate. Pay attention. "When you're eating, really be aware of…the sight and the texture and the taste of food," Timmerman says. "We go out to eat because it's enjoyable, it's pleasurable, it tastes good—all of that. If you're really paying attention, maybe you don't have to eat the whole basket of fries; you can eat just a handful." Slow down. It can take our bodies up to 20 minutes to register the fact that we're full—and during that time we're often continuing to stuff ourselves. Proponents of mindful eating recommend taking your time, chewing your food carefully, and treating a meal as a leisurely stroll rather than a race. Drop the fork. While you're eating, put your fork down for a moment and assess how you're feeling. "We get into such a habit of picking up the fork and putting food in our mouths, without even checking in with ourselves to see, 'Am I still hungry, or am I full?'" Albers says.